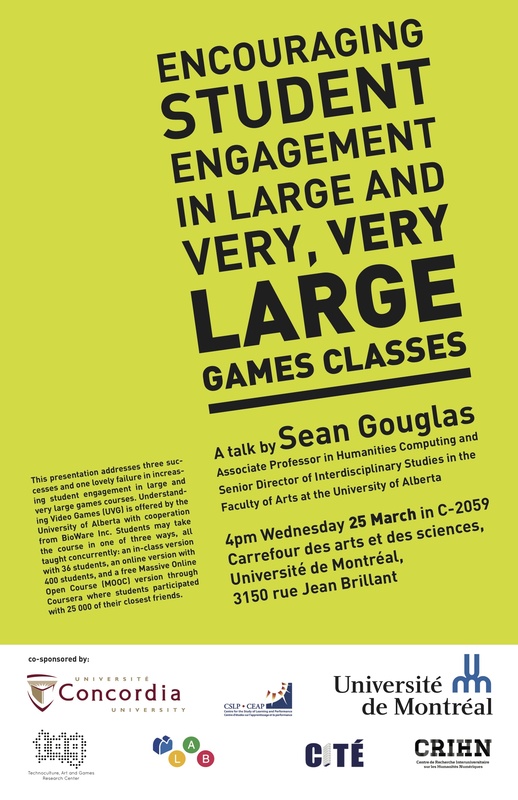 A talk by Sean Gouglas Associate Professor in Humanities Computing and Senior Director of Interdisciplinary Studies in the Faculty of Arts at the University of Alberta. This presentation addresses three successes and one lovely failure in increasing student engagement in large and very large games courses. Understanding Video Games (UVG) is offered by the University of Alberta with cooperation from BioWare Inc. Students may take the course in one of three ways, all taught concurrently: an in-class version with 36 students, an online version with 400 students, and a free Massive Online Open Course (MOOC) version through Coursera where students participated with 25 000 of their closest friends.